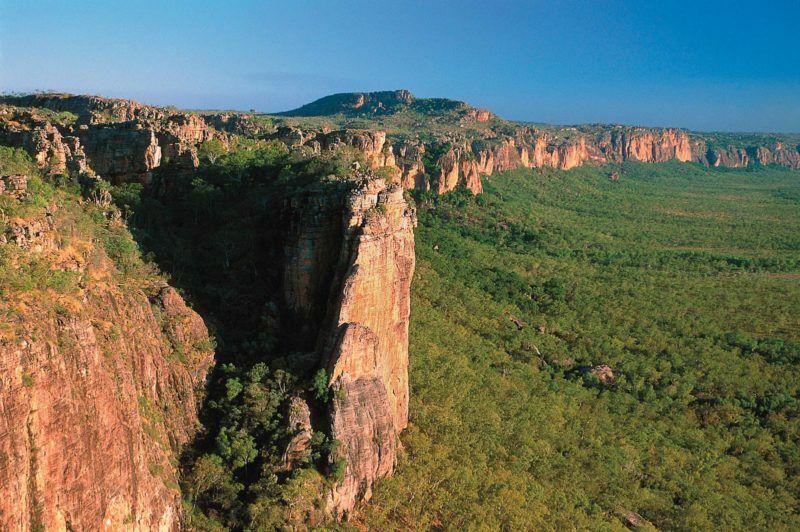 Litchfield Tourist Park is a great base for your Litchfield adventure. 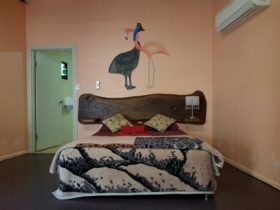 Located in the heart of cattle country, the Upper Finniss River meanders through the property, cattle and horses roam freely over the back fence and native birds and wildlife make themselves at home. There are a range of accommodation options. 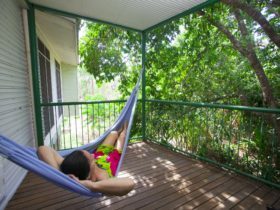 Stay at The Homestead, ideal for large groups or families, to wake up to bird song in a private Stockman’s or Drover’s cabin. There’s also individual bunkhouses or camping and caravan facilities. Fill up with a hearty breakfast at the cafe-in-a-shed overlooking the lush gardens. For lunch, try ‘one of the best Burgers in town’ from your standard hamburger to the more adventurous crocodile, buffalo or barramundi burgers. The cafe is open daily for breakfast and lunch from 8am to 3pm. An early 6pm dinner service is available 5 nights a week, between April and October – Bookings essential. 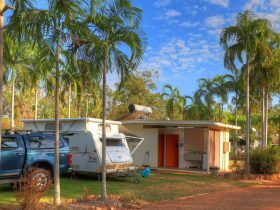 Bush luxury – Territory Style. 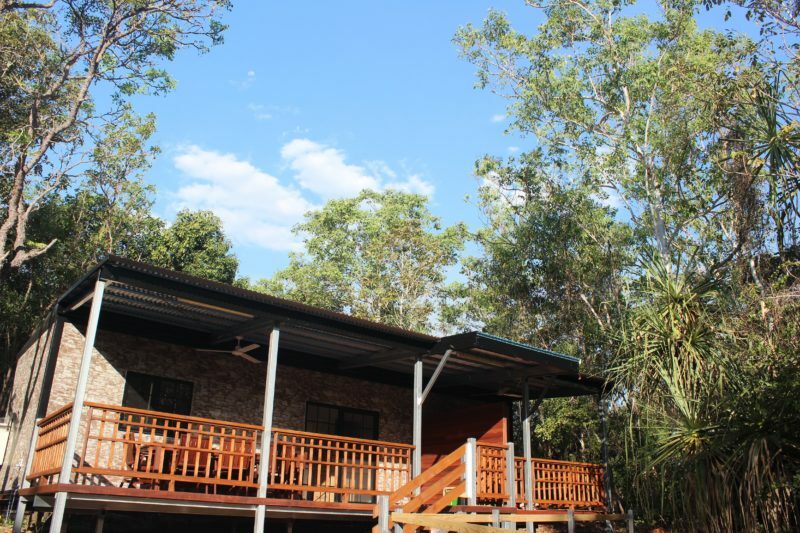 These cabins have one queen size bedroom and a second bedroom with 2 single beds. The bathroom has a shower and bathtub with views of the sky and tree’s, the bathroom courtyard also has an outdoor shower. A large dining verandah with barbecue is serviced by a small kitchenette with microwave, fridge, toaster, kettle and basic crockery and cultery. Airconditioned throughout with satellite TV in both bedrooms. 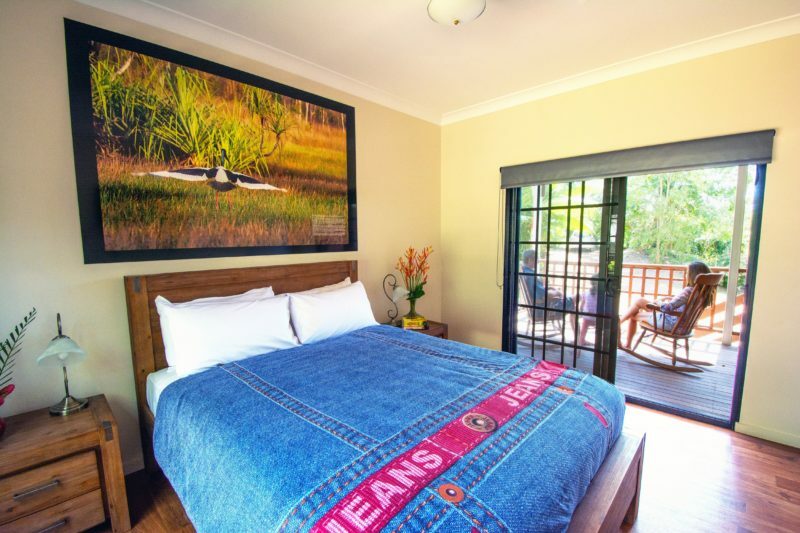 Located near the Park’s swimming pool and bathroom complex makes these cabins ideal for travelling families and friends. 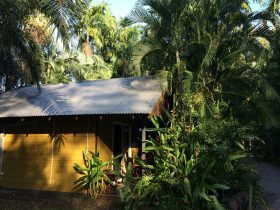 The Drover’s Cabin contains one double and one single bed, a verandah with table, chairs and barbecue. Please note these cabins do not have their own private bathroom but are located near to the Park’s main bathroom complex. 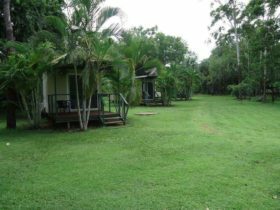 Bush luxury – Territory Style. This is the 2 bedroom cabin can cater for families of 6. There is one queen size bedroom and a second bedroom with 4 single beds. The bathroom has a shower and bathtub with views of the sky and tree’s, the bathroom courtyard also has an outdoor shower. A large dining verandah with barbecue is serviced by a small kitchenette with microwave, fridge, dishwasher, toaster, kettle and basic crockery and cultery. Airconditioned throughout with satellite TV in both bedrooms. 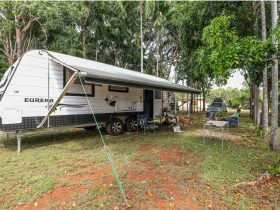 Options range from unpowered camping through to a variety of cabins and the Homestead – a 3 bedroom house.